Celtics center Aron Baynes, right, should have been called for a late foul in Game 5, the NBA said. 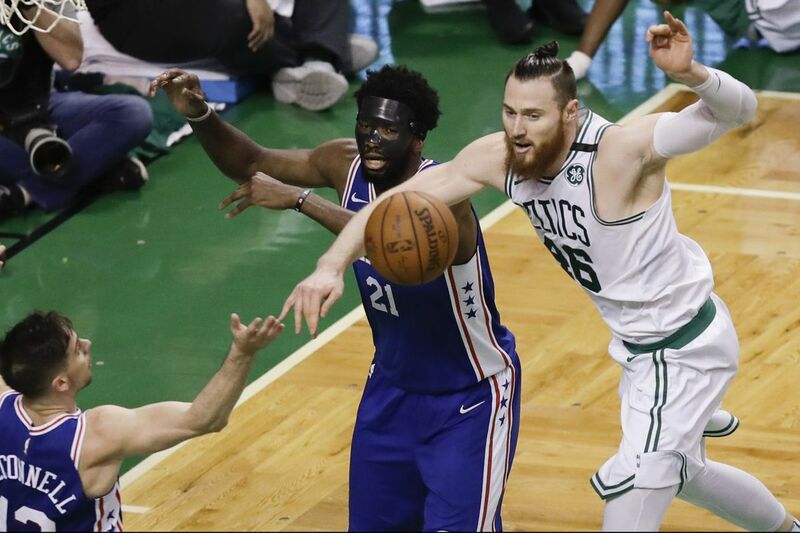 The NBA has announced that its officials missed two key calls in the closing seconds of the Boston Celtics' 114-112 victory over the 76ers in Game 5 of their Eastern Conference semifinals. The win Wednesday night enabled Boston to close out the series and advance to face Cleveland in the conference finals. The league's Last Two Minutes Report, released Thursday night, ruled that Celtics center Aron Baynes committed a foul and guard Marcus Smart turned the ball over in the closing seconds. Neither infraction was called by the officials. The report said Baynes should have been called for a foul on Joel Embiid's game-tying layup attempt with 14.6 seconds left. Baynes, according to the report, made "contact to Embiid's arm that affects his shot attempt near the rim.'" The Sixers trailed by two points at the time, and Embiid would have gone to the foul line for a chance to tie the score had a foul been called. The report also said the officials missed Smart's traveling violation with 1.5 seconds left after he had intercepted Ben Simmons' desperation heave. Down by two points, the Sixers would have had another opportunity to knot the score or win the game had the traveling been called.